"An extraordinary encounter with another human being." 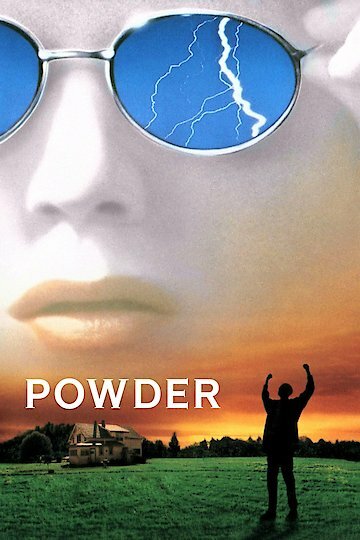 Powder is a story about a boy with odd supernatural abilities. When the boy's mother was in labor with him, she was struck by lightening on the way to her car. Later, in the hospital, the lightening struck again as the boy was being delivered. The boy, named Jeremy, grew up with his grandparents. He led a sheltered life on their farm where he spent most of his time in a basement area he fixed up with shelves of books. After his grandparents die, a social worker comes to the house looking for the now teenage boy. She finds him hiding inside his basement room and is shocked at the pale or translucent color of his skin. The boy's skin color is where he gets the nickname of Powder from. Believing it is in the boy's best interest to be enrolled in a regular school, the social worker gets him set up in classes at the local high school. While in science class one day, the lights in the class begin to flicker and a strange charge of electricity targets Powder. Later on, he begins drawing metal objects to himself because he is magnetized. While the science teacher finds this phenomenon amazing, the kids in his class think it is odd and quickly turn against him. Powder's magnetic abilities are not the only unusual aspect of his biological makeup. After being tested by school officials it turns out he has the highest IQ on record. He can quote any text located within any of the books he has read just by the page number. Powder still leads a sheltered life and feels most comfortable when he is at his grandparents farm. Electricity is still drawn to him whenever there is a storm in the area. In the end, Powder chooses to resolve his personal conflicts by taking matters into his own hands. Powder is currently available to watch and stream, buy on demand at Amazon, Vudu, FandangoNow, iTunes, YouTube VOD online.